The problem with UFO’s is…..
that after sitting on a shelf for more years than I want to admit to you need to finish them. I am very excited about this quilt – I started it in the 90’s – it was a block of the month class. Every month on the first Thursday we would meet to learn the newest block. I had decided to hand piece my blocks – most of them are hand pieced, a couple are done by machine. The problem with the completion of this quilt was that the blocks were all different sizes. The completion instructions were to square them up to the average size of the blocks. Big Problem, some were 15 1/2″ some were 17 1/2″, cutting the larger ones down would have cut off the wonderful points of my stars. The other problem was that I didn’t have a ruler large enough to square them up. So after careful contemplation I decided to add the backgound fabric to all of the blocks that were too small. 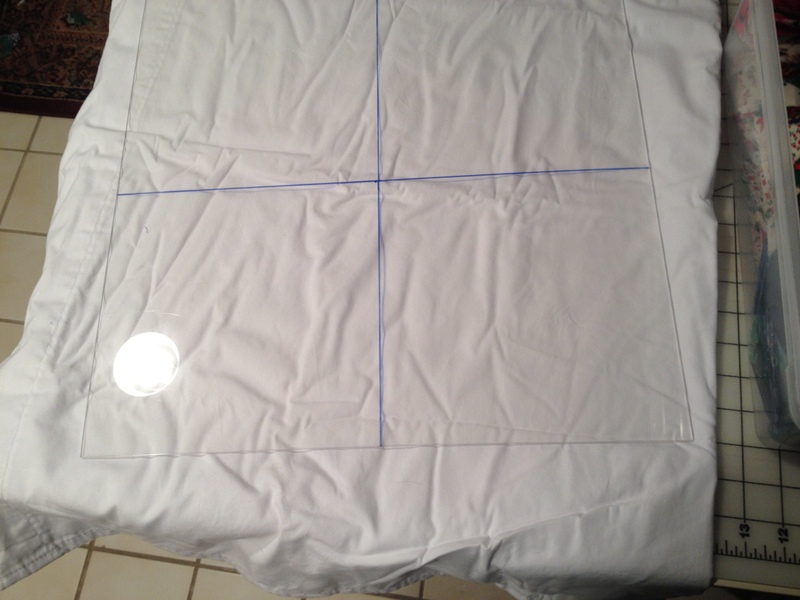 I then went to the local glass repair shop and asked them to cut me a piece of plexiglass that was 17.5″ square. I used a Black Sharpie to mark the center lines. I could now use this to be sure that all of my blocks were the same size. I had saved the extra fabric along with the blocks in a tote so that I wouldn’t have to worry about matching fabrics when I finally completed the quilt. I put the sashing on the quilt and then thought about borders. Last night I brought it upstairs to preview it on the bed. Horrors – It is to small – it is long enough but not wide enough. So back to the stash – AKA fabrics. So after digging through the piles of Christmas fabrics that I have – after measuring and figuring and choosing I decided to use the same fabric as the sashing. It was really the only fabric that looked good and that I had enough of. I really liked the red border as the final border but now it will be a green. I will post another picture when it is finished. So, that is the problem with UFO’s – lesson learned. Don’t let those quilts sit on the shelf for 20 years. Pull them out and get working on them or give them away, or make placemats or tote bags to donate to charity. Or discuss with other quilters what has become your road block. There is a reason that you started the quilt all those years ago – you loved the pattern or the fabric, you wanted to take the class with your friends, you were interested in learning a new technique. 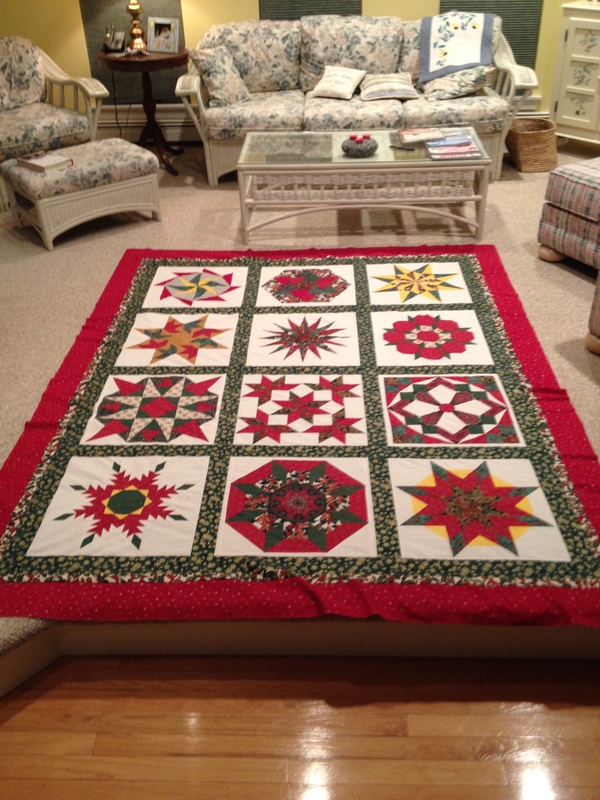 Something got in the way of the completion of the quilt – you needed a different ruler, the blocks didn’t turn out the way you wanted, you moved and the quilt doesn’t go with anything in your house. The reasons – or excuses are endless and so is the guilt that we feel every time we stumble upon the pile on the shelf. So finish it or re-purpose it into something useful for someone else. All of my beds will have Christmas quilts on them this December. I have been wanting to accomplish that for many years. Yup…that is the trouble I have too.